We have a giant, old apple tree on our little homestead. It's an amazing blessing that each year gives us lots of fruit. We make a bunch of hard cider, a goodly amount of apple crisps, and can up around 50 pints of applesauce. Recipes for applesauce abound, I know, but this method is quick and easy when time might be short. 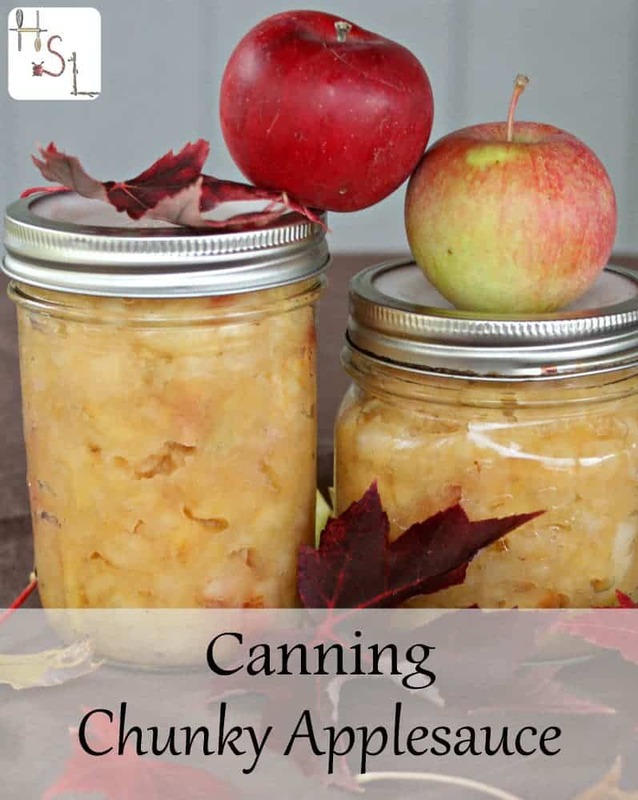 Canning chunky applesauce is done with minimal equipment and open to customization. I know this is going to sound odd to many folks and certainly to applesauce purists but there's no reason to peel in most cases. If someone, is really opposed, by all means peel but around here we don't. Just core and quarter those apples. Toss those apple quarters into a pot with about two inches of water in the bottom. Add some lemon juice. Put a lid on the pot and bring to a boil. Cook until the apples are very soft. Remove from heat. Use a potato masher and mash those apples to a desired level of chunky. Return the pan to the stove and sweeten and add spice, if desired. Bring to a boil again. Add the chunky applesauce to hot jars leaving 1/2″ headspace for canning (1″ headspace for freezing). Process in a boiling water canner for 20 minutes (adjusting for elevation) or freeze. 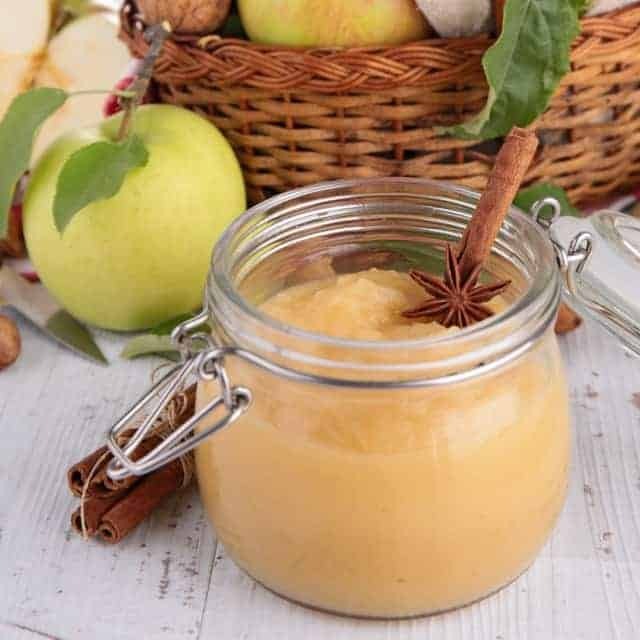 Use this quick and easy method for canning chunky applesauce this fall. Put the apples into a heavy pan with two inches of water and the lemon juice. Cook until the fruit is soft. Once the fruit is soft, remove from heat. Mash to the desired texture. Return the mashed fruit to the pan and reheat. Add sugar, if desired. Heat until just boiling and sugar is dissolved. Remove from heat. Pour the sauce into hot jars, leaving ½” headspace at the top. Process for 20 minutes, adding time for elevation. I will use the pints for more applesauce, but peeling them is a must. Maybe it depends on the variety used, but my kids complain when they find “fish bones” in their sauce. The jelly jars are for apple pie jam, which is the last sweet spread on my to-do list. I can always use more jars, great give away! Gifts gifts and more gifts!! The Holidays are coming! I’m dehydrating fruits and herbs right now, so that would be my immediate use. I love to make my own applesauce, but I’ve done it in very small batches and use right away. The jars definitely would be used!! that much I remember. The Chow-chow cabbage, and cauliflower. I have tried three different applebutter recipes, and they did not look, or taste like the recipe my mother used to make. I am a great-grandmother now, making her a great great-grandmother, and my sister said she doesn’t remember any more, since she quit cooking years ago. So I am stuck, can anybody help?! It would be greatly appreciated. I’m kinda picky about my apple butter flavor and I’ve found what works the best is to follow the recipe that gets the closest to what I like and then I just keep adding spices until I get the flavor I want, adding spices will not change the acid levels so you don’t need to worry about that. The spices I’d add are cloves, cinnamon, nutmeg, and black pepper. My Mom always cooks hers in the oven and I’ve found that’s the best method flavor wise also. Good luck!! Our apple tree is heavy with fruit this year! Applesauce would fill every one of those beautiful jars! I’ll be making fig jam and filling jars shortly. These would be perfect!! Can’t have too many jars! They have so many uses, oh, and canning too! I’m making Christmas presents with the jars! My garden just exploded with seasonal delights, so I’ve been canning like crazy. These jars will help me continue to can. This looks great! I preserve apple sauce every year – smooth though! Cooked down on the stove or crock pot. I like to use 1/2 or 1/4 pint jars since there are only 2 people in my household. It’s great for cooking or is enough for a serving or two without a jar open in the back of the refrigerator. Also do pints for gifts though! I would use these jars for canning apple or pear butter for my family members. I would definitely be watching your blog for a great canning recipe for these gorgeous jars!! Applesauce was one of the first things I ever canned. I love homemade applesauce! It just doesn’t get any easier! Thanks for sharing! I would use the jars for more violet jelly, chicken soups, and probably some pickled eggs if there are any wide mouth jars. I’d use the jars for canned chicken. Would love to win. Your site is very informative and I look forward to your posts. Thanks for the opportunity to win this wonderful give-away, and for the chunky applesauce recipe. I always forget to make it chunky like my mother used to do. When my kids were little they liked it smooth so I got into that habit, but I actually prefer it chunky … and with those nutritious skins. Thanks again. Apple sauce, apple butter and apple pie filling all can up well and are on my to-do list for October. New jars would be a great help. This is the first year with no pumpkin butter… need to get on that next. Not peeling gives apple sauce a pretty color too! I could always use more jars – Please send more. I love having as many canning jars as I can this time of year. There is a thing called “Master Tonic” which is fermented from various things. It makes a cure all for most Fall/Winter aliments and as a side product a spicy condiment for chips! However, after making it a storing it for awhile. The tops become corroded. The natural cure all’s, such as what you are talking about always work better than any prescription, or commercial product. It sounds like lifelike another ‘bag balm’, only for inside ailments, instead of wounds to the outside like bag balm. I love the natural ones. They are cheap, taste a lot better and no chemicals or dangerous side effects.? I would love the recipe, and fermentation time. Always looking for tried, and true remedies. I want to make and can apple butter. I will make blackberry jam, peach jam, apple, pear and pumpkin butters and give these as holiday gifts. I want to make Apple butter and peach jam. I would be canning for the first time, so I will probably can fruit. I would use them for gifts. I would make some of my specialties to give as Christmas gifts-Blueberry/Grand Marnier Jam, Peach Bourbon Jam, Orange Chablis Jelly, and Sweet Onion Comfit. We like to can jams, tomatoes, pickles, etc. I am just beginning my adventures of canning, but loving keeping the freshness of my garden-picked veggies! I’d make some of my grandpa’s fig preserves, and maybe try my hand at some apple butter. Did someone say, “more canning jars, please!” Yeah. We just used every. last. jar. for blackberry and strawberry. Bought some apples at the local orchard and sure could use more canning jars to do more canning. May even try something new like apple jelly. Winning these would be perfect! Our family travels 3-4 hours each Fall to go apple picking. If I won these jars, they would be used for apple butter and apple pie jam. Yum! I would use the jelly jars to make raspberry preserves, the canning jars I would use to make homemade salsa and pickles. That applesauce looks tasty. And weirdly, looking at the pictures, you can’t even tell the peels are in there. I am constantly running out of jars.. I think I am finished canning and my husband wants to know why I didn’t can pears or something else.. I just picked about 5 bushels of organic apples yesterday! I can wait to use these jars. I want to can some more tomatoes. There is never enough strawberry jam around here either! AROUND HERE WE LIKE TO ADD RED HOTS TO MAKE SPICY SAUCE. I would can some sort of apple relish!